Sparks fly when electric Aquarius and fiery Aries meet. Both of these signs are highly independent and bent on doing their own thing. But is this a case of too much freedom for a committed relationship to be formed? 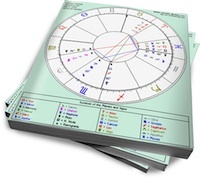 Venus in Aquarius brings a touch of the outsider to her relationships. She can be a loyal partner, but she’s most comfortable expressing her love with friendly detachment. She can be very understanding of her partner’s emotional needs and is not phased by demands. Traditional relationships are not her thing; she needs room to express her quirky energy and a partner who understands this. Her lover must also accept that there will always be a part of Ms. Aquarius that he cannot touch. Mars in Aries brings the heart of a warrior to his relationships. Full-on passion and excitement are what this lover has to offer. However, Mr. Aries has no use for romance or niceties. Blunt and impatient, he can be childish when he wants something (or someone). A creature of instinct, he will charge ahead without thinking when he finds someone he is attracted to. The chase is what turns him on, and he’ll quickly get bored if he’s not challenged (but if he’s left hanging too long he’ll move on to the next prospect). Mr. Aries will be captivated by Ms. Aquarius’s cool, edgy glamor … and she’ll be intrigued by his boldness. Things will heat up quickly between these two as they enjoy an adventurous, impulsive affair. Each will appreciate the others’ need for space, and it’s doubtful that they’ll sit still long enough for boredom to set in. But this could contribute to the relationship’s lack of stability. Ms. Aquarius can be ferociously stubborn about doing her own thing, and Mr. Aries will just do what he wants without asking. Aries may get frustrated with what he perceives as Aquarius’s lack of response to his passionate demands. Both will be so focused on their respective liberties that a long-term bond may never develop. Without some grounding influences in their charts, this relationship could burn out quickly. Currently me and my man, but he’s the aquarius venus an I’m the Aries mars. We haven’t made anything official but we have been on am off for a year now, I’m a Taurus and a Pisces, water dom for me, almost certain he’s air dom so we click. Minus the fact my dominant sign is a air sign along with his venus is a air along with mine, so we tend to not have slot of stability even though that may be the case. I still feel connected to him.